Denhay has been awarded a Good Pig Award, presented to Jim Loescher at the Compassion in World Farming Good Farm Animal Welfare Awards held at the Milan Expo. 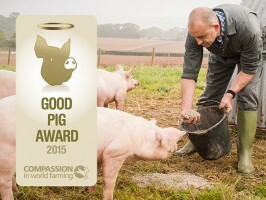 Dr Tracey Jones, Director of Food Business at Compassion in World Farming said: “The Good Pig Award was only launched in 2012 so it is great to see that there is already real momentum behind it with five businesses this year, committing to improve the lives of pigs in the food chain. Their work alone will positively impact on over 85,000 pigs. “Winning a Good Pig Award is a fantastic accolade for our Denhay brand (part of Denhay Farms Ltd). We are passionate about producing the best dry cured bacon and gammon, which for us means using high welfare, outdoor bred, British pork. We have developed a dedicated supply chain with British farmers who are committed to growing their pigs to the high specification we require.